As most of you know, I've spent the past few months in a big writing shlump. Every time I sat down to write it felt like the inspiration was gone. I was unmotivated, bored with my book, and discouraged. There I was, giving you guys advice when I couldn't even get myself to write. It sucked! But now, I am happy to finally say that I have the motivation to write again! In fact, I have been working on Unperfected consistently all week, knocking out a chapter (or more) a day. This is also the reason there was no post on Tuesday. I specifically had time set aside to write a post on Tuesday, but instead I got sucked into my book and by the time I looked up from my word document it was too late to update the blog. I didn't post, but I finally wrote a lot! So sorry, not sorry. Anyway, today I thought I'd talk about the different blocks that can hinder you from writing. Though instead of focusing on the physical blocks (like time, lack of a computer or notebook, etc) I want to focus on the mental blocks. 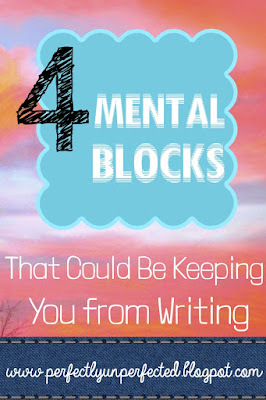 There are a lot of possible mental blocks you could be dealing with, but I want to focus on these four simply because they're the ones that I struggle with the most, and they seem to be pretty common among writers! 1. Boredom. From what I've seen, this tends to be most common during the editing stages, after you've read your book over, and over, and over, and over again. Though, that doesn't mean it can't happen to those still in the writing stages. Either way, the trick here is to make a change! Try rewriting one of the chapters you've read over and over, or change the personality of one of your minor characters. Add a new plot twist. Shoot a character. Whatever you want! Just change something and see how it goes. If you don't like it, scrap it and keep trying. 2. Lack of confidence. As I mentioned in last week's post, being confident in your own writing is very important. So if you find yourself suddenly stuck and unable to write, take a look at your confidence level. Did you recently compare yourself to another (possibly better) writer? Did you get rejected by an agent and are now unsure if writing is for you? There are lots of possibilities here. To fix this, find a way to give yourself a confidence boost! I mentioned a few in last week's post, such as reading over a passage of your book that you're particularly proud of, reading positive comments people have given you on your work, etc. 3. Fear of failure. What if I never finish this book? What if I'm wasting my time? What if all of this is pointless? Sound familiar? I struggled with these kinds of thoughts a lot when I was first writing Unperfected. I was afraid that I was going to spend all of my time writing wasted words and never type "the end." Because of that, I spent a lot of hours not writing. The trick here is to change your thinking. The only way you're going to fail is if you let yourself! The more you write, the sooner you'll finish. 4. Wrong focus. Going off of that, sometimes your lack of motivation (as well as fear of failure) can come from you focusing on the wrong thing. For a long time, I was so focused on publication and achieving my dreams that it blinded me from seeing a lot of errors in my story. So when I was later able to see those errors clearly, it scared me and I got depressed and unmotivated by how much work I had to do. But now, I've changed my story so my ideas are fresh and new and exciting! I forced myself to stop focusing on publication and instead focus on making my story as great as it can be. Not for a future career, but because I love my story and I love writing. You must be psychic, because I have been struggling to write one story. I keep getting sucked into other ones that have been swimming about in my head - never follow the plot bunnies. I think #1 might be the one I'm struggling with. I probably need to adjust the plot to make it more exciting, like you suggested. That might fix it. 5. Distraction. Having way too much stuff going on in your life and not paying enough attention to yourself and your own writing. Also, youtube.